House For Sale in Sevenoaks for Price on Application. 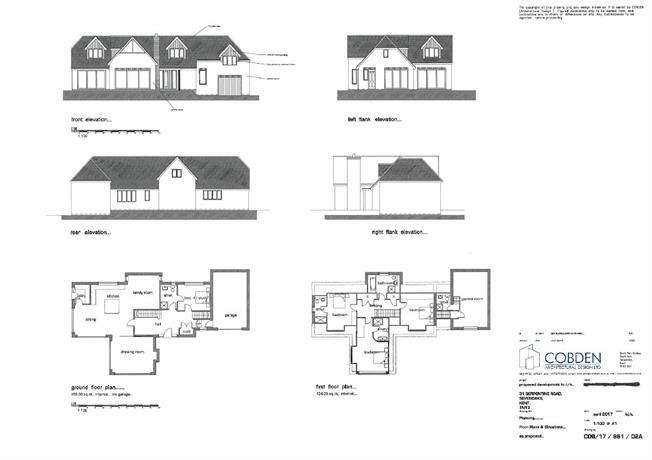 Located in a sought-after residential location, this is a plot that extends to 0.22 acres including the driveway and has planning permission for a detached house of 3261 sq. ft. There is currently a building contract in place, and the current owners have started the build process and completion is expected late 2019/early 2020. The property provides an exciting opportunity to build a property in the centre of Sevenoaks, with full planning permission under reference 17/02785/Ful and 18/03097/FUL. The property has been designed to be a versatile 4/5 bedroom house. It is currently arranged as three first floor bedrooms with bath or shower rooms and a games room with en-suite shower room. There is a study on the ground floor which is also designed as bedroom 4 and has an ensuite shower room. The majority of the living space has been designed to be open plan but there is a formal sitting room. The property has also been designed with integral garaging. Rarely do such plots come to the open market and this presents an excellent opportunity for a buyer to create their own home and have control over the specification. Further details on the planning can be provided upon request. The building plot is located in a sought-after residential location that is equidistant from Sevenoaks High Street and Sevenoaks station 1.2 miles away. It is convenient for St John's Primary School and Walthamstow Hall and other schools in the vicinity include Sevenoaks Prep, Trinity, Weald of Kent Grammar and Sevenoaks School. There are numerous lesiure facility nearby including golf at Knole and Wildernesse, tennis and Hockey at Hollybush and cricket at The Vine. Sevenoaks High Street has an excellent range of boutique shops, restaurants and supermarkets. Sevenoaks station has excellent mainline links to London Bridge, Waterloo East and Charing Cross. The plot is 3.8 miles from Junction 5 of the M25 providing links to the national motorway network.